Here is a perfect example of a game that was designed with a touchscreen in mind, but pushed onto the Nintendo Switch with minimal support or focus. Of course, the Switch does feature a smart touchscreen – it’s wonderfully responsive and accurate. However, for me, the brilliance of the system comes from the versatility it offers. Red Game Without A Great Name takes a game that would be ideal on a phone and tries to translate it to this slightly bigger screen. The problems are apparent from the off. Controlling a bird that teleports to points on the screen by tapping and dragging is a fine idea in principle, but in action it falls short. Levels begin simply; tap the bird and drag him to where you’d like it to end up. There are few obstacles and the cogs that are on offer to collect, are within reach. But as the levels fall away and you’re challenged with zipping in and out of danger with speed, everything becomes a frustration. 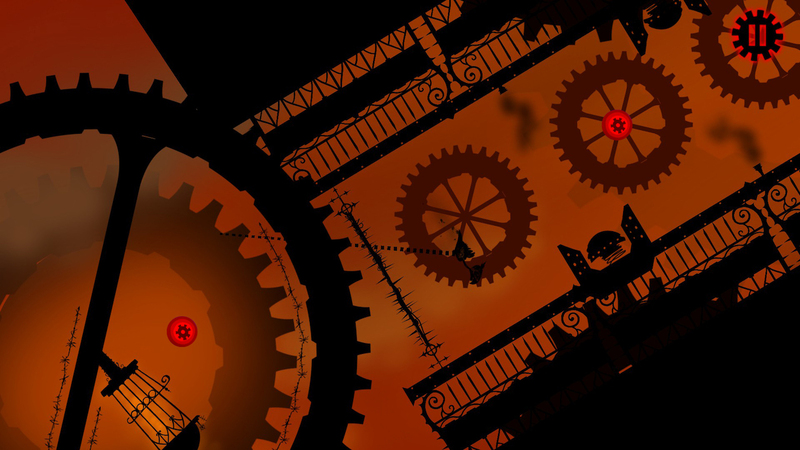 That’s not to put too much on the difficulty curve of the game – if you ignore the cogs, the levels are a lot easier, but that takes away an aspect of the game that explores further than the basic premise. Without the cogs – not that they really offer much more than a little extra challenge in dexterity – the game becomes very limited. Then there’s my main problem with Red Game Without A Great Name. Many of the teleporting jumps rely on very precise timing to stop this poor bird from clattering into barbed wire or other traps. This wouldn’t be much trouble but, and here’s the kicker, the entire game is an auto-scroller. The levels are constantly on the move meaning that timing is key and those lacking in finger flexing speed will often find themselves restarting the entire level as they die for the umpteenth time. This doesn’t take into account the fact that for much of the playtime your hand will be obscuring a portion of the screen, making the manoeuvrers even more elaborate. Yes, this last point would occur on any touchscreen system, but here it feels even more ludicrous because the Switch is a system that has sticks and buttons. The developer could have experimented with implementing these controls into the game, rather than just shoehorning the Red Game Without A Great Name onto the system. It’s a real shame as the premise itself is appealing and the art style is sumptuous and brooding. But, beauty is only skin deep, after all.